Everything changed when E85 came to town. The days of having separate tunes for pump gas versus race gas are now just a memory for many. Every day, more enthusiasts make the switch to E85. If you are blessed enough to live in an area that has access to this fuel, why wouldn’t you make the switch? 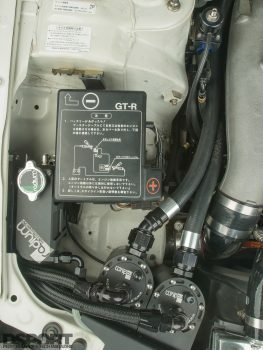 You can crank up the boost to make the same power as most race gasolines, yet the cost is less than pump gas. Adding a flex-fuel sensor to the mix provides total fuel compatibility so not having an E85 station on your route won’t leave you stranded. 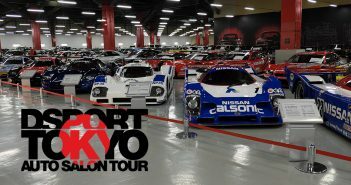 Since our aim with our Project Time Capsule R34 GT-R is to get with the modern times, upgrading and updating the fuel system to be optimized for E85 was the goal. We already know that the engine and turbo combination that we’ve setup is capable of producing over 850 horsepower at the wheels on E85. To support 850 horsepower at the wheels, the fuel system needs to be able to support about 1,000 horsepower at the engine itself. Supporting 1,000 horsepower on E85 requires an even more capable fuel system than an engine running on gasoline making the same horsepower. 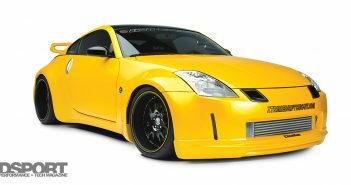 In fact, the fuel system demands for an E85 engine at 1,000 horsepower are the same as the fuel demands of a gasoline engine at 1,400 horsepower. The bottom line is that a seriously capable fuel system is needed. Not only must it be fully compatible with E85, it must also be fully capable to meet the fuel delivery demands of the engine. In the past, the go-to solution would have likely been to figure a way to stuff three conventional fuel pumps in the tank via some special hanger and hat assembly. While we have used these systems successfully for a number of years, they do have drawbacks. Many of these pumps can draw over 30 amps each so you can be faced with some serious 100-amp electrical demands. On top of that, the failure of a single pump could often be masked and missed leading to fuel supply issues. Fortunately, there are now better alternatives. “Brushless” is a term that you should expect to be hearing more and more in the performance aftermarket. Brushless motors outperform conventional brushed motors while also providing an extended service life along with the ability to deliver variable speeds. While Holley may be a brand that your parents associated with performance carburetors, its newest product line is all about leading-edge fuel injection and fuel delivery solutions. Among these solutions sit the VR1 and VR2 brushless fuel pumps. These fuel pumps combine a high-efficiency brushless motor to a high-efficiency twin-screw-type pump section. The end result is that these pumps put out insane amounts of flow even at high pressures. Even at full pressure and flow, the current demands of the pumps are less than half of what you would see with a conventional high-performance pump. Since our engine can make about 850 wheel horsepower at 30-35psi of boost pressure, we needed a fuel pump that could supply enough E85 at that working pressure (75-80psi). The Holley VR1 (#12-1500) will be able to get it done while never drawing more than 19 amps of current. Best of all, the included speed controller has a low-speed mode that reduces the pump speed to about 40 percent of its peak output. In this mode, the fuel pump pulls less than 8 amps of current. The Holley VR1 pump also has the ability to extend its output capabilities with higher input voltages. Increasing the pump’s supply voltage from 13.8 volts to 18.5 volts increases the pump’s output by over 35 percent. While Holley supplies the charts and specs needed to determine if the VR1, or its bigger brother the VR2, is right for you, the basic rule is that the VR1 will support about 1,500 flywheel horsepower or 1,250 wheel horsepower on gasoline assuming that you can make that power at or under 40psi of boost pressure. On E85, the VR1 will support about 1,200 flywheel horsepower or 1,000 wheel horsepower. If you make more than that, the VR1 can still support an additional 35-percent more power if the supply voltage to the pump is increased to 18.5 volts. The VR2 offering simply delivers double for those 2,000+ wheel horsepower applications. Since the Holley VR1 brushless pump is an external pump design, we decided to build the fuel system around a surge tank design. In these designs, an in-tank pump is used to simply fill the surge tank that then acts as the fuel supply for the VR1 pump. The surge tank is also filled by the return fuel from the fuel system. Once completely full, overflow from the surge tank gets directed back into the main tank. 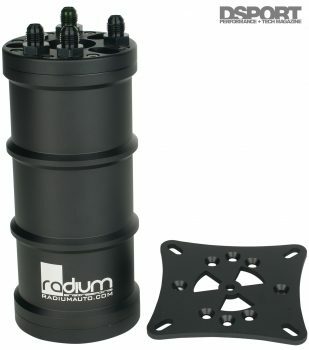 Radium Engineering supplied its fuel surge tank for the project. This CNC-machined solution did the trick once again for us (we used other products from its lineup in our Project R33). Unless your vehicle came from the factory as a flex-fuel vehicle, there is no guarantee that every component in the fuel system is going to be happy about the change in fuel type. While pumps are nearly always upgraded to E85 compatible units, the lines are often overlooked. Everyone agrees that PTFE-lined hoses are 100-percent compatible with E85. Since we had to upgrade the leaking fuel hoses on the R34 anyway, it only made sense to use a worry-free solution. Since the original fuel system incorporated some hard lines, we decided to use some hard lines in addition to new lines in the new fuel system. 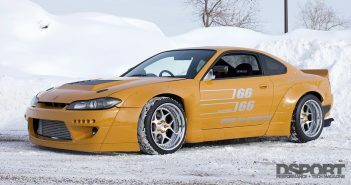 Shingo from BLUEMOON Performance used an XRP ProPlus race hose for the fuel system along with XRP performance fittings. The ProPlus race hose features a smooth internal bore PTFE inner tube that is externally convoluted for additional strength and tight bend radius. For the outer braid, the ProPlus is available with XRP’s XtraTemp Monofilament, Aramid Fiber, Aramid Fiber with Silicone or Stainless Steel. The end result is a lightweight, high-performance, high-flow plumbing solution that will not deteriorate with age. While XRP’s top of the line HS-79 hose does have performance advantages over the ProPlus series, its lower cost will make it a more popular choice. 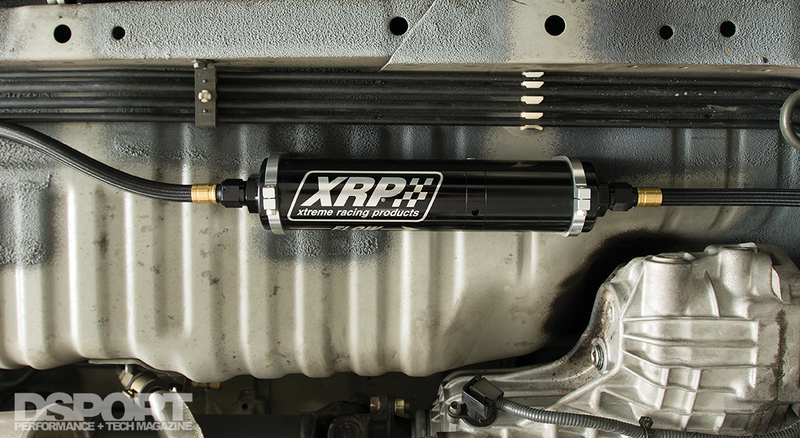 XRP ProPlus race hose, XRP performance fittings and an XRP multi-stage fuel filter deliver E85 without a hiccup. XRP ProPlus race hose features a smooth internal bore PTFE inner tube for maximum flow. With the host of Radium Engineering, Holley Performance and XRP establishing the fuel supply system, the delivery of fuel into the cylinders would be up to a set of Fuel Injector Clinic injectors. We opted for the high-impedance, ball and seat 1100 cc/min injectors (p/n IS185-1100H). These injectors should be good for the 750-to-850 wheel horsepower range on E85 depending on the base fuel pressure (43.5psi to 55psi range). We aren’t going to know exact numbers until we complete the final tuning on the vehicle. The FIC 1100 cc/min injectors just dropped in the Radium Engineering fuel rail. Be sure to eliminate the resistor box when changing to high-impedence injectors on the RB.